Cooking your oatmeal takes three more minutes…max…and so worth it. 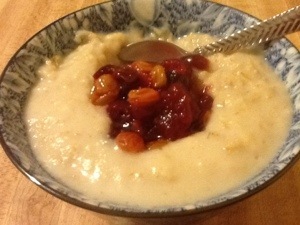 I stirred in a pinch of Vanilla Salt and about 1/4 cup of Silk Pure Almond (unsweetened Vanilla) then added a few generous spoons of my homemade cranberry compote. It’s the healthy beginning of a yummy day! The sun came up today and revealed a lovely crisp autumn morning. My husband I went to early Mass and we stopped at the Orange Cat afterward, as is our custom. I hung out with Dorothy, Tim and my other buddies for a while then decided to get a head start on my a thanksgiving preparation. I headed over to Tops to pick up some of the things that will not perish prior to their use Wednesday and Thursday. Today I’m going to make my cranberry compote. This year I am going to double the recipe and preserve some for myself and friends. The house will soon smell so good. I walked around the produce department twice and could not locate the cranberries. I was slightly panicked so I asked Mike Fland, one of my favorite grocers if there were any. He jokingly told me no as he walked to the display and revealed many bags. Phew. Crisis averted. One of the key ingredients in the compote are oranges. The pickin’s were slim and I asked Mike about that. He said they were expecting some this morning but my time restraints prevented me from waiting. 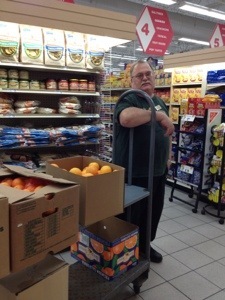 As I was chatting with my friend Annie, Mike wheeled a cart toward us filled with oranges. How cool is that? That is great customer service and why you never lose when you shop locally. Mike has been with the store for 22 years, starting in 1990. Thanks again Mike! Sometimes it can take an hour to pick up one thing…you see all kinds of people and catch up between aisles. I saw my friend Annie and she told me she was thinking of making the stuffing recipe I posted yesterday. She asked me a few questions and I showed her the stuffing I was talking about. It is croutons seasoned (or not) in bags. It makes a completely different consistency dressing than one made with bread. It’s the one I was raised on so it’s what I know. I am never more flattered than when someone tells me they read my column. What blows me away is when they tell me they use my recipes. Please let me know if you ever have any questions about any of the original (or family) recipes I publish. If you can’t make them then what’s the point, you know what I mean?